About 15% of the 1.3 billion tons of food waste generated annually is edible peels, the company's founder said. His dried fruit snacks are aimed at lowering this figure. When Matt Weiss was growing up, his great-grandmother left an impression on him. He said she lived until about 100 years old and never let any part of food go to waste. "She was focused on all the scraps, what she would call roots, rinds, skins and stems. And would always remind my sister and I that is where all the nutrients are," Weiss told Food Dive. Last year, Weiss founded Rind Snacks, a company that makes dehydrated fruit snacks that include the peel. The New York-based company currently offers three varieties: Tropical Blend with dried oranges, pineapples and kiwis; Orchard Blend with persimmons, apples and peaches, and a Tangy Kiwi bag. The three-pack of snacks, which are 3 ounces each, sells for $17.99. Weiss said he found a gap in the $2 billion dried fruit and nuts category. There are a lot of private label products, little brand loyalty, many added sugars and mostly traditional dried fruits, like apples, prunes and raisins. "So right away the light bulb went off that a little bit of a disruption in a sleepy category is just what the market needed," he said. "You have to be different in a very competitive snack marketplace and you have to stand out and be a little edgy. Rind sits at the intersection of two big trends in the snacking industry today: sustainability and functionality. About 15% of the annual 1.3 billion tons of food waste is edible peels, Weiss said, and Rind Snacks is helping to fight that food waste. "So instead of taking what was going to be discarded, we are preserving that and providing a more nutritious snack," he said. "The angle of 'the fruit, the whole fruit and nothing but the fruit' is really resonating with people that look at the environmental impact of their diet and their eating habits." And, according to survey data from Nielsen, consumers care about sustainability more than ever before. About 48% of U.S. consumers are likely to change their purchasing behavior based on the foods' environmental attributes. The product's colorful bags contain the tagline: "Keep it real. Eat the peel." Weiss said the company's message resonates with consumers as it helps to "educate people that they can snack better and do better by retaining the entirety of the fruit." For functionality, he said the rind of the fruit offers three times the fiber content of a traditional peeled fruit snack, and three times the vitamin C content. “There's a whole generation of snackers who are looking for bolder, more assertive tangy taste with added benefits,” he said. "And this health message around the functional benefits of the rind and the fighting food waste angle of not letting any part of the food go to waste just brought it all together." 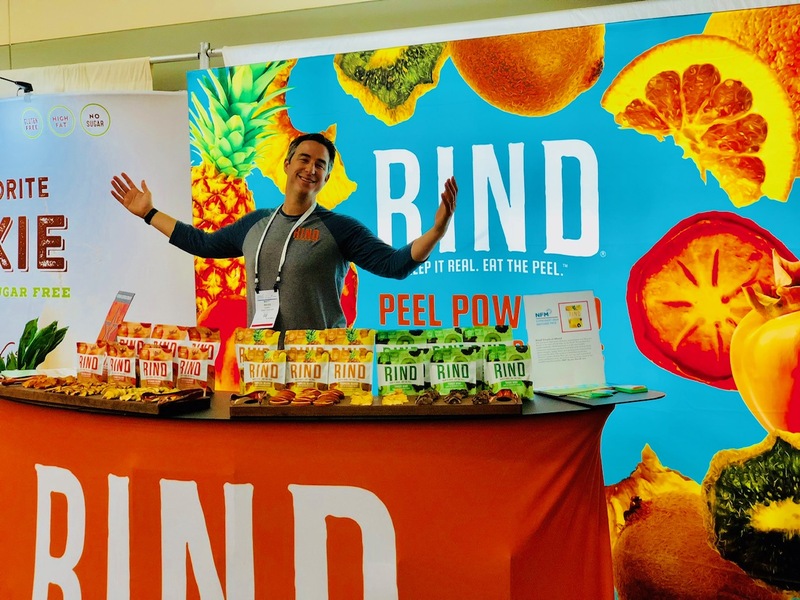 Rind Snacks launched in March 2018 selling its products on Amazon and its own website. Now the company has 250 points of distribution in retail, including Whole Foods 365 stores and a variety of independent markets in the Northeast. The company is also rapidly expanding its online reach with triple digit month-over-month growth. Offline, it continues to add retailers and distributors. Weiss said he expects to see more growth this year. The company plans to launch a fourth SKU in the summer. It is also starting to grow into the food service market with corporations like Twitter and WeWork beginning to supply the snacks in their offices. Customer reception to the products has been good because there is nothing else like this out there, Weiss said. Today's consumers are more accepting of adventurous textures and taste profiles. This product is "not just a bag of peels," he said, but a slice of the dehydrated fruit that retains as much of the peel and the natural skin of the fruit as possible. "We call it the power in the peel, and people really enjoy it, and I don't think they'd enjoy it if it were just the peel, just like I don't think they enjoy it when it's overly sweet and it's just the flesh," Weiss said. "When you do the combination of the two, you provide that nice bittersweet balance that people look for."